I am the Commander in Chief! 我是三軍統帥! I am the Commander in Chief! Some readers may be wondering what this posting is all about. 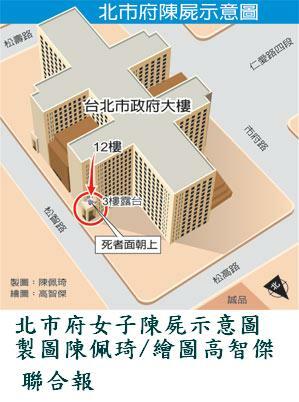 Chen Shui-bian, feeling the heat from the Pan Blue initiated recall process, has been sweating bullets. Why is Chen so afraid of being recalled? Chen is afraid of being recalled because during the four years he legally occupied the office of the president, followed by the two years he illegally occupied the office of the president, he committed so many crimes he can’t afford to allow himself to be recalled. 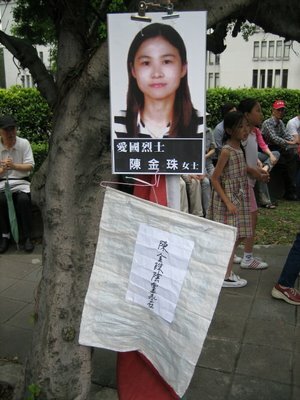 The moment Chen is recalled is the moment Chen loses control of the judiciary. The moment Chen loses control of the judiciary is the moment Chen and his wife will suffer the same fate as former Philippines kleptocrats Ferdinand and Imelda Marcos, and former South Korean kleptocrats Chun Doo-hwan and Roe Tae-woo. Therefore in order to prove that he still had his hand on the controls of the central government, Chen ordered an impromptu troop review on the island of Kinmen (Jingmen), just off the coast of Fujian. The troop review, which Chen called for out of the blue, for no apparent rhyme or reason, was not about anything so mundane as actually reviewing the troops for their military preparedness. The “troop review” was Chen’s laughable attempt to assert that “I’m still in charge goddammit!” The troop review was a trembling Chen, puckering his lips, dry from anxiety, whistling in the dark. Actually, the photo above was not taken on Kinmen. It was taken earlier, elsewhere. But doesn’t it look perfect for the caption? And what’s a little artistic license now and then? 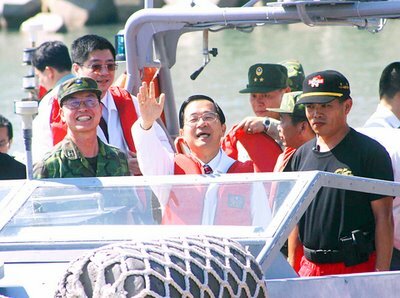 Caption: Inspecting Kinmen, the president declares: I am the Commander in Chief! The Taipei Times, apparently unconcerned about the potential for ironic commentary from what the Pan Green camp likes to call the “tong pai mei ti” (pro unification media), reported on Chen’s latest bout of petulance. Quoting words attributed to former US president John F. Kennedy in the Hollywood movie Thirteen Days, Chen said that all military chains of command end with the president. “That is the meaning of the leader of the armed forces,” Chen said. Wow. I hope you’re duly impressed by Chen’s importance. He certainly is. 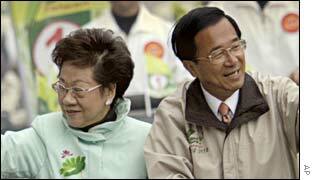 Chen said: “There are some people who refuse to recognize me as the president of Taiwan. They refuse to address me as the president, but refer to me with my full name as if they were calling their child,” he said. Now why in the world would they do that? The following is a letter to the editor of one of numerous US newspapers that published a recent AP article on North Korea’s missile test. The letter has been revised for style as well as expanded in content. Your June 25, 2006 article, “Missile threat could test United States,” by William Foreman of the Associated Press, committed an all too common mistake. It implies secession. It implies successful secession. It implies a fait accompli. In fact, China’s current situation is nearly identical to that of East and West Germany prior to German reunification. What most people referred to as “East Germany” was in fact the German Democratic Republic. 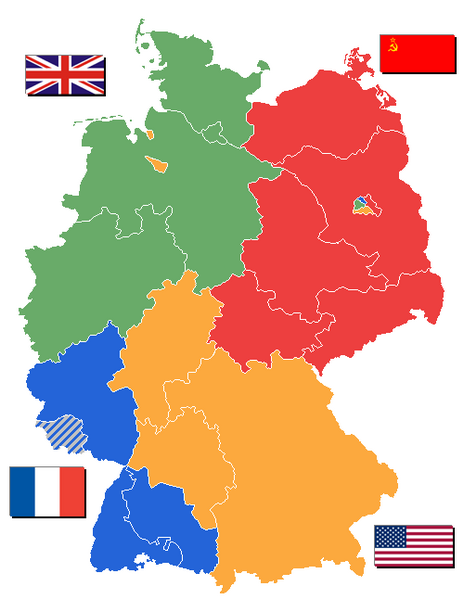 What most people referred to as “West Germany” was in fact the Federal Republic of Germany. Similarly, what many people sloppily refer to as “Taiwan” is in fact the Republic of China. What many people sloppily refer to as “China” is in fact the People’s Republic of China. In any event, the trend is clear. The US government is no longer willing, and more importantly, no longer able, to bear the cost required to maliciously keep China separated into warring halves. China, like Germany, will eventually be reunified, sooner if not later. Ironically, China will be reunified sooner, almost immediately, if Taiwan independence Quislings are so obtuse as to insist on declaring formal independence. China will be be reunified later, perhaps decades later, if Pan Blue political figures succeed in regaining control of the ROC executive branch in 2008. Are They Stupid and Ignorant, or merely Dishonest? In case you thought the rampant hysteria in last Friday’s Taipei Times editorial, “Taiwan, Banana Republic of China?” was an exception, think again. “Ma’s brazen attack on Taiwan’s democracy,” by frequent Taipei Times contributor Cao Chang-qing, brims over with the same hyperbole, parody, and sarcasm. Telling a simple truth requires only understatement, solemnity, and civility. That’s because the truth pretty much speaks for itself. Telling a lie, on the other hand, requires hyperbole, parody, and sarcasm. That’s because a lie needs all the help it can get. When a writer resorts to hyperbole, parody, and sarcasm, it means he knows he is telling a lie, but hopes to make the lie more convincing by enbellishing it as much help as possible. It means he hopes that at least some listeners will believe the lie merely because he has turned the volume control knob all the way up to high. Read Cao’s editorial yourself, and ask yourself which political camp is telling a simple truth, and which political camp is telling a convoluted lie. 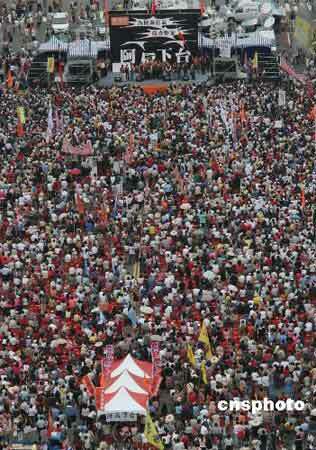 Is it the Pan Blues, who are saying simply that a corrupt political leader ought to be replaced? Anyone without a deeper understanding of the political situation in Taiwan would be excused for thinking that President Chen Shui-bian must have violated a slew of laws to cause the pan-blue camp to call for his blood and launch a formal motion for his recall. Even Chinese Nationalist Party (KMT) Chairman Ma Ying-jeou said, mouth dripping with venom, that unless Chen steps down, the people will rise up and topple him, giving him a nasty death. “Topple” and “die a nasty death” are phrases implying violence and coups d’etat that make us think of China’s Cultural Revolution, a time when the air was filled with shouts of “topple” and people were driven to “nasty deaths” on a daily basis. Comment: After regaling us with the above purple prose lead in, Cao Chang-qing then makes two assertions, both unadulterated nonsense, legally, logically, and historically. First, Cao asserts that because the Pan Blue camp’s recall motion does not require proof that Chen is guilty of criminal wrongdoing, that constitutes proof that Chen is innocent of criminal wrongdoing. Cao: When Ma gave his reasons for supporting the recall motion, he inadvertently told us the truth. He said that the motion to recall Chen was a “political action” and that “a violation of the law is not necessary” to support such a move. 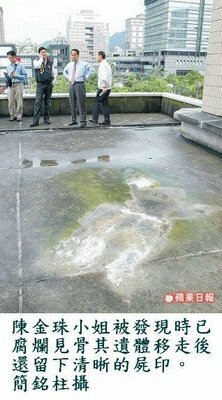 In the midst of the barrage of pan-blue accusations against Chen, this was tantamount to telling the world that Chen had not violated the law and that he was not involved in the corruption scandals; that these accusations, in effect, were political fabrications without any foundation in fact. That is the only reason why Ma, a former minister of justice with a law degree, said that “a violation of the law is not necessary,” since that washes Chen clean of all criminal suspicions. Comment: Chen Shui-bian, his immediate family, his in laws, his cronies, and his fellow ruling DPP officials, have engaged in every form of corruption known to man, including patronage, bribery, extortion, influence peddling, fraud, embezzlement, and nepotism. 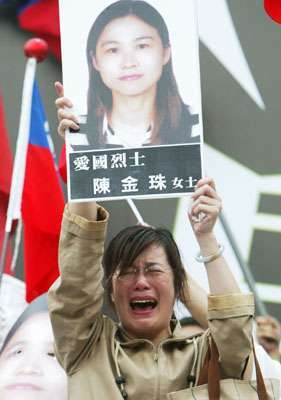 Taiwan independence apologists have demanded that those outraged by prima facie evidence of ruling DPP corruption must first prove corruption by means of the criminal justice system, and if they can’t, they must shut up. 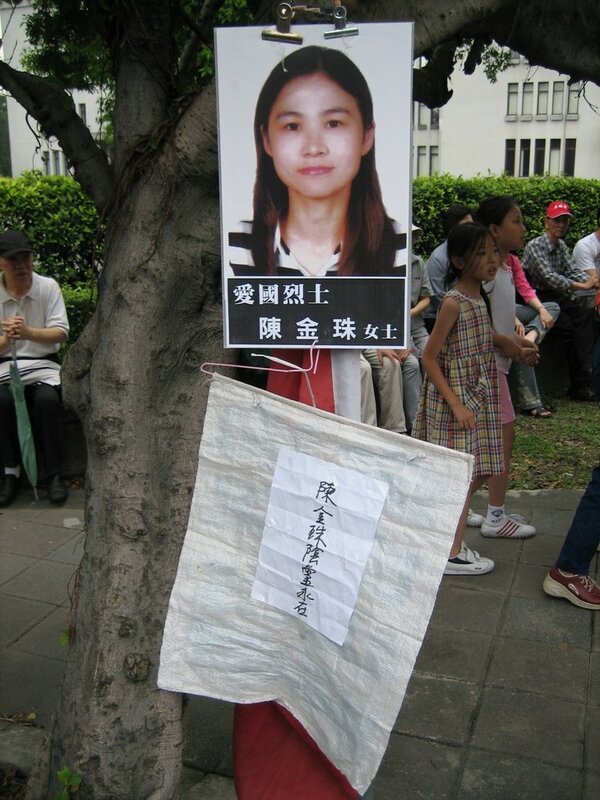 But as anyone familiar with the grim reality of Taiwan’s “democracy” knows, ruling DPP malfeasance includes the hijacking of the criminal justice system, or at least its upper echelons. Put simply, the ruling DPP owns the criminal justice system. Lower echelon public prosecutors and criminal investigators are at best, coerced into passively sitting on their hands and biting their tongues, or at worst, actively persecuting whistleblowers who are exposing ruling DPP corruption. To ask victims of ruling DPP corruption to rely on the ruling DPP’s criminal justice system to protect them from ruling DPP victimization, is to ask chickens to rely on the fox to guard the henhouse. 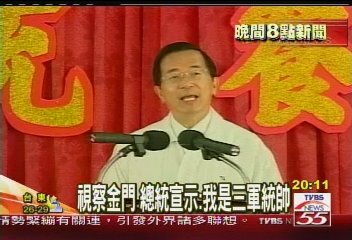 Cao: This statement is a shameless attack on Taiwan’s democracy. In Western democracies, there is no way to recall a head of state based on political actions … If it were possible to recall the head of state in two-party or multi-party systems for their political actions, political views and policy differences would turn democracy into a farce where parties would take turns recalling each other’s head of state — a preposterous, unimaginable situation. 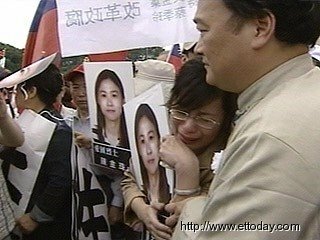 Such a preposterous and unimaginable situation is currently being played out in Taiwan. The biggest opposition party has held a demonstration to incite the public, and its chairman has even said that “a violation of the law is not necessary” to recall the president, his political actions are enough. Comment: What precisely does Cao find so “preposterous” and “unimaginable” about recalling an elected official on political, rather than criiminal grounds? An elected official is, theoretically speaking, a public servant. When a public servant is elected, he is hired. When a public servant is recalled, he is fired. If electing someone on political grounds is the people’s inalienable right, as self-styled “champions of democracy” so shrilly insist, then why isn’t unelecting someone on political grounds, i.e., recalling them, also their inalienable right? Proof of criminal wrongdoing is not necessary to fire an elected official, nor should it be. It is enough that his employer, i.e., the people, the taxpayers, the voters, are unhappy with his job performance. 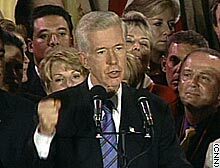 As California voters know perfectly well, in the fall of 2003, sitting Democratic Governor Gray Davis was recalled and replaced with Republican Arnold Schwarzenegger, on political rather than criminal grounds, with no apology needed. No proof of criminal wrongdoing on the part of Davis was necessary to initiate the recall, nor was any offered. Davis was recalled purely on the basis that in the subjective opinion of California voters, he wasn’t doing a satisfactory job. Are Cao and his fellow Taiwan independence apologists truly unable to deduce for themselves what procedures are or are not reasonable under constitutionalism and the rule of law? 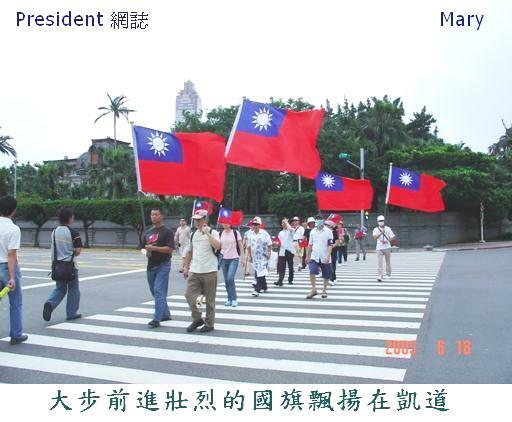 One, Cao and his fellow Taiwan independence apologists know the nonsense they have spouted about the Pan Blue sponsored recall effort is untrue, in which case they are merely dishonest. Two, Cao and his fellow Taiwan independence apologists actually think the nonsense they have spouted about the Pan Blue sponsored recall effort is true, in which case they are both stupid and ignorant. A good rule of thumb in political debate is that you can judge the seriousness of an adversary’s argument by the seriousness with which he treats yours. If he takes you seriously, it means he’s pretty certain he’s got you beat on the merits. But if he resorts to hyperbole, parody, and sarcasm, then he clearly fears an honest debate. The Taipei Times is the English language propaganda organ for the Taiwan independence movement. Taipei Times news reports are often indistinguishable from pro Taiwan independence editorials. Taipei Times editorials meanwhile, are often indistinguishable from the ravings of streetcorner prophets. But with their sophomorically titled, and even more sophmorically written “Taiwan, Banana Republic of China?” the editors of the Taipei Times have truly outdone themselves. I have been writing about the Taiwan independence issue for over a decade, since the mid 1990s. I can honestly say that in all that time I have never encountered a pro Taiwan independence editorial as full of hyperbole, parody, and sarcasm as this one. Read it and decide for yourself whether the editors of the Taipei Times believe they have the Pan Blue opposition beat on the merits of the impeachment and recall controversy, or are terrified of an honest debate? Read it and decide for yourself whether the editorial doesn’t reveal the desperation Taiwan independence spin controllers must be experiencing, more eloquently than anything a Pan Blue pundit might author? Editorial: Taiwan, Banana Republic of China? Okay, so let’s imagine for a moment that, all reason having been tossed aside, President Chen Shui-bian succumbs to the demands of the opposition parties and resigns. 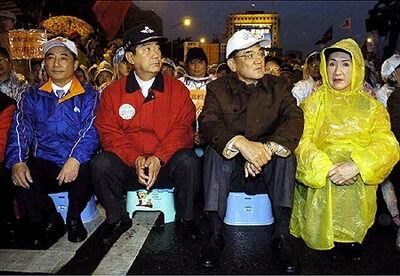 Such an event would mark the end of democracy in Taiwan and the beginning of mob rule. Taiwan would be left with a mockery of a political system based on the mercurial whims of the entrenched political elite. Heads of state could be selected and overthrown based on deals made in backrooms, by ever-changing alliances of different political factions. Of course, such a system would leave the general public with little room to exercise its right to choose its leaders, but that shouldn’t be a problem. Let’s take a page from our comrades in Zhongnanhai. They tell the Chinese people that they aren’t ready for democracy — that it is an ugly affair, which inevitably results in chaos. Well, aren’t they correct? 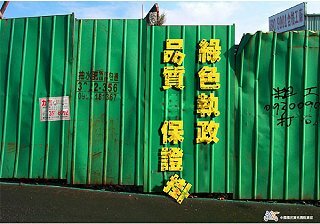 Isn’t Taiwan chaotic, now that it is a democracy? 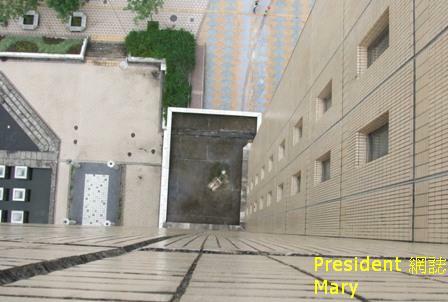 Isn’t the lawlessness of modern Taiwan terrible? Maybe it isn’t exactly the anarchy depicted in the film The Road Warrior, replete with bike gangs who terrorize the populace — but that’s the logical next step, isn’t it? Oh, the horror of our society. Why, one can’t walk the streets at night without fear of being robbed or killed, right? Luckily, the opposition parties are trying to do something to counteract the vicious chaos of democracy, with its hideous personal freedoms and its awful system of making the government accountable to the people. They have devised a better system, in which government officials are held to account by other government officials. They can all keep each other honest together, because nothing is so honest as a politician. The more politicians you have, the more honesty you have — that’s the logic behind all of this. The people need never be bothered by having to make decisions about their country or its leaders — that’s what the political elite is for. The elite is supposed to control things — that’s what makes them elite. And they should control the people, because the people don’t know how to control themselves — that’s why there is so much chaos in Taiwan. So the opposition parties can solve all of this by forcing the president out of office. They don’t like him and they don’t want him. And why should they? Just because he was duly elected by a majority of the voters? Just because a fundamental underpinning of democratic systems is the belief that governments exist solely by the consent of the governed? Well, the opposition parties have shown that they believe Taiwan needs no such confusing, namby-pamby hogwash if it wants to get things done. The opposition parties have a better way — a stronger, simpler way of dealing with the problems of governance. The opposition parties can ensure that the people will never be upset by having to read stories about government corruption again. After all, they have decades of experience in controlling the media and persecuting critics. If a journalist wants to pester the people by talking about government malfeasance and graft, the solution is simple: shoot her. Isn’t this what the opposition parties envision for us? Can’t they bring back the heady, halcyon days of orderly, calm, controlled society? 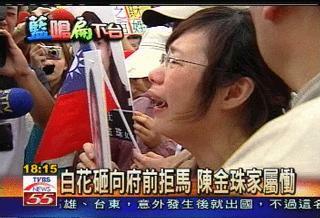 Taiwan can once again grow and prosper under the loving care and stern gaze of Big Brother. Surely it’s much more preferable for Taiwan to seek the safety and security of totalitarian rule. So let’s give three cheers for the opposition and their plan to squash the menace and terror of democracy. Comment: The truth is I’m reluctant to take too much time out to refute the Taipei Times’ editorial. After all, what could I possibly say that wouldn’t insult the readers’ intelligence? What could I possibly say that wouldn’t imply, however inadvertently, that readers couldn’t see through the Taipei Times’ transparent nonsense without my help? On the other hand, some readers may be coming into this issue for the first time. These readers may be unfamiliar with Taiwan’s Alice in Wonderland, Through the Looking Glass political universe, in which “mei you hei bai, zhi you lan lu” (There is no black and white, there is only blue and green). These readers may not have enough background about the presidential impeachment and recall controversy to realize that the Taipei Times’ editorial is nothing more than the raucous barking of a dog that can’t bite. These readers deserve a cursory rebuttal. A cursory rebuttal however, is all that is warranted. Anything more would do these readers a disservice, giving them the mistaken impression that the Taipei Times actually presented a case at all. In fact, the Taipei Times failed to offer a single coherent argument. Instead, it made a string of hysterical allegations and advanced a series of logical non sequiteurs totally unrelated to anything the Pan Blue opposition has said or done. An American or European reader unfamiliar with Taiwan’s politics, after reading the Taipei Times’ editorial, might be forgiven for concluding that the Pan Blue opposition was a military junta about to stage a Latin American style coup d’etat and march into the Presidential Palace. In fact, the predominantly middle class, law-abiding to a fault Pan Blue opposition has made its intentions crystal clear. The Pan Blue opposition intends to impeach or recall Chen Shui-bian, entirely within the constitutional framework of the Republic of China, in strict accordance with the Republic of China’s Election and Recall Laws, even though these laws make impeachment or recall nearly impossible. To impeach Chen, a motion must be initiated by over half of the ROC legislature, endorsed by two-thirds of the ROC legislature, then presented to the 15 member Council of Grand Justices for adjudication. To recall Chen, a motion must be initiated by over a fourth of the ROC legislature, endorsed by two-thirds of the ROC legislature, then approved by at least half the valid ballots cast by at least half of all eligible voters in a national referendum. As the editors of the Taipei Times are fully aware, the Pan Blue opposition by itself does not constitute a two-thirds supermajority in the ROC legislature. 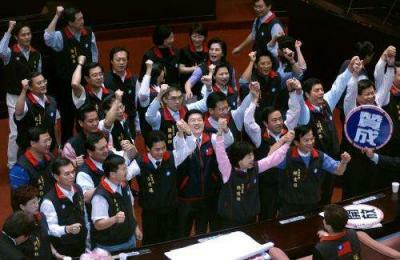 Without the participation of over 30 Pan Green legislators, the Pan Blue opposition does not have enough votes to recall Chen. Even if the Pan Blue opposition manages to persuade over 30 Pan Green legislators to side with them against the ruling Pan Green kleptocracy, a successfull recall still requires an absolute majority of at least half of all eligible voters in a national referendum. Even if the Pan Blue opposition manages to impeach or recall Chen, it has made clear it intends to recognize Chen’s running mate and current “vice president” Annette Lu, as his successor. 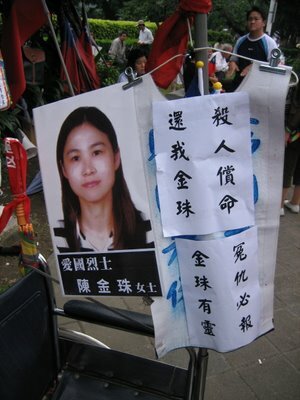 Be aware that as a matter of law, the Pan Blue opposition is not obligated to recognize Annette Lu as Chen’s successor. The Pan Blue opposition would be well within its rights to recall both Chen and Lu simultaneously. The Pan Blue opposition’s decision to recall only Chen and not Lu is an act of political discretion, not a legal obligation. Be aware that as a matter of law, Chen Shui-bian and Annette Lu should not be sitting in the Presidential Palace in the first place. Both are illegitimate usurpers. Lien Chan and James Soong are the duly elected president and vice president of the Republic of China, having won the 2004 Republic of China Presidential Election by a 53% to 47% margin. The only reason Lien Chan and James Soong are not currently sitting in the Presidential Palace is that the Bush II regime pulled a fast one on them. 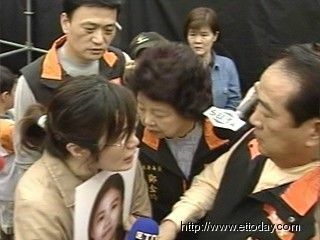 On March 27, 2004, it promised to back their demands for a new election, providing they released their political chokehold on Chen. But once the 500,000 to 1,000,000 strong crowd of Pan Blue and independent citizens dispersed, the US government, the “world’s champion of democracy,” stabbed the democratic majority of ROC voters in the back, disingenuously citing the Central Election Commission’s rubberstamping of Chen’s “election” as the official end of the dispute. I could painstakingly rebut each and every one of the editorial’s hysterical allegations, one after another. By now, even readers totally unfamiliar with the Taiwan independence issue should be able to see that the Taipei Times’ uncontrolled apoplexy has nothing to do with anything taking place in the real world. The editors of the Taipei Times, by resorting to hyperbole, parody, and sarcasm, have revealed that they are in desperate fear of an honest debate. Considering the sorry plight of today’s Taiwan, the result of the DPP’s much touted “lu se zhi zheng, pin zhi bao zheng!” (Green government, quality guaranteed!) they should be. 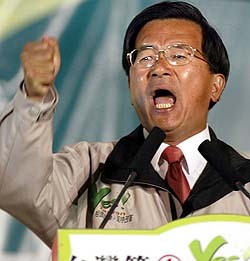 The “pan-blue” alliance is enjoying a much higher constituency ratio than the “pan-green” camp at about 80:20, compared with the past level of 55:45, following the exposure of a spate of scandals surrounding President Chen Shui-bian’s wife and son-in-law, according to ex-lawmaker Shen Fu-hsiung of the ruling Democratic Progressive Party (DPP). Shen made the remarks when delivering a speech at Shuteh University of Science and Technology in Kaohsiung, southern Taiwan, Wednesday night. Shen forecast that the number of seats at the Taipei City Council held by the DPP would drop to 12 or 13 from the existing 17, while that for the pan-blue camp would rise to 59 or 60. Comment: Unfortunately for the DPP, Shen Fu-hsiung is right. Unless the DPP party hierarchy wises up and listens to black sheep party member Shen Fu-hsiung, who insists that the DPP must undergo fundamental reform and reconsider what it stands for, the DPP is finished. 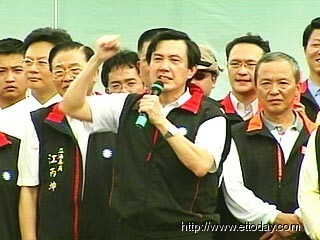 Shen dared to tell DPP True Believers that “The emperor has no clothes!” and had better cover itself up, PDQ. Such frankness is no longer acceptable within today’s willfully blind DPP, and Shen has since become a pariah within his own party. Will the DPP party hierachy heed Shen’s advice? Formally Shen is still a DPP party member, but in name only. 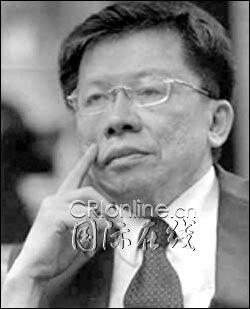 Practically speaking, Shen is already an ex DPP party member, and has joined the ranks of ex DPP members Hsu Hsing-liang, Shih Ming-teh, Sisy Chen, and Cheng Li-wen. The DPP was once a genuinely “democratic and progressive” political party, in which anything and everything was up for debate. But the moment it seized power in 2000, the DPP changed. 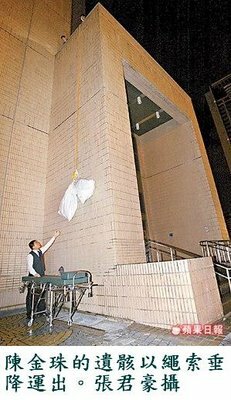 What the DPP acquired in 2000, thanks to the machinations of Pan Green wolf in Pan Blue sheep’s clothing Lee Teng-hui, was near absolute power. What that near absolute power did, was corrupt the DPP nearly absolutely. 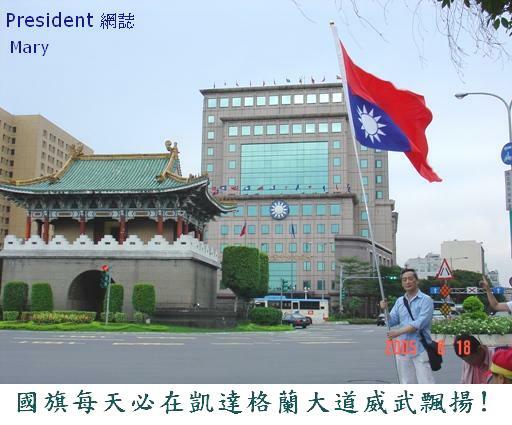 That near absolute power has nearly absolutely corrupted the Taiwan independence movement, the pro Taiwan independence Democratic Progressive Party, but most of all, the unchallenged leader of both the movement and the party, Chen Shui-bian. The DPP party hierarchy made a fateful decision with its recent joint statement, signed by DPP Chairman Yu Shyi-kun, Vice President Annette Lu, Premier Su Tseng-chang, and former premier Frank Hsieh. On May 27, 006, these “Si Da Tian Wang” (Four Great Kings of Heaven), so-called, rallied behind Chen Shui-bian, despite everything Chen has done over the past six years. In doing so, they signed a suicide pact. As I said in my recent article, “The DPP continues down its Suicidal Path,” I welcome their decision. I mean that, in all seriousness. Why wouldn’t a Deep Blue Chinese reunificationist such as myself welcome such a strategic Pan Green blunder? The DPP is its own worst enemy. The DPP party hierarchy’s monumentally short-sighted decision will inflict more political damage upon the largest and most powerful pro independence political party than the shrewdest attempt at political subversion by any strategist within the Pan Blue camp. 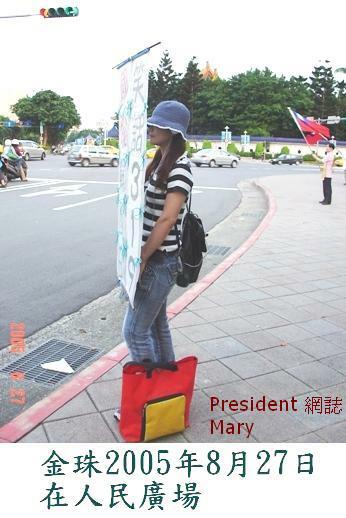 The DPP party hierarchy’s myopic beyond belief decision to sweep Chen’s egregious shortcomings under the rug and pretend nothing is wrong, will ensure the early demise not only of the DPP as a political party, but far more importantly, of Taiwan independence as a political ideology. But Deep Green political leaders are so blinded by their doctrinaire fundamentalism, nothing Pale Green DPP elders such as Shen Fu-hsiung might say or do, let alone anything detested Deep Blue New Party pundits such as myself might say or do, is ever going to persuade them to reflect upon the error of their ways. As a result, the DPP party hierarchy will continue alienating more and more Chinese people on Taiwan. 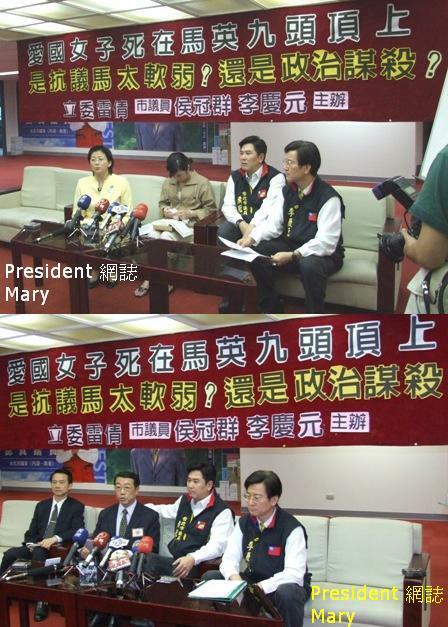 As a result, I eagerly look forward to the outcome of the upcoming 2007 Republic of China Legislative Election. If you thought the 2004 legislative election was a Pan Green debacle, wait til you see the returns from the 2007 legislative election. This fall, the DPP will celebrate its twentieth anniversary. It had better make the most of it, because at the rate it’s going, it might not be around to celebrate its twenty-first. 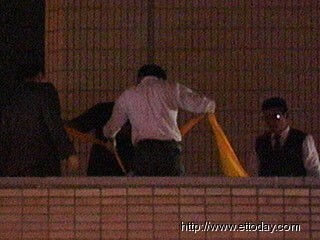 Caption: Female Pan Blue protestor’s dead body turns up at Taipei City Hall. Questions abound. 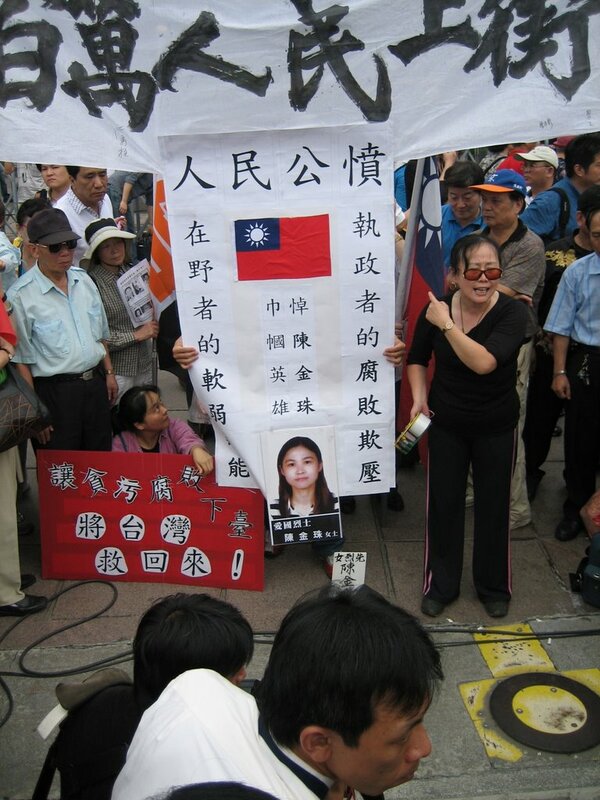 On May 31, 2006, pro independence legislators in the Republic of China legislature prevented the passage of two amendments that would have permitted direct airline flights and maritime shipping between the mainland region of China and the Taiwan region of China. Pro independence legislators prevented the passage of the two amendments not by means of a democratic majority in the Republic of China legislature. Pro independence legislators have never constituted a majority within the ROC legislature. Pro independence legislators prevented the passage of the two amendments not by resorting to devious but legal stalling tactics. They already exhausted that option with a failed filibuster. Pro independence legislators prevented the passage of the two amendments by means of physical violence. What do I mean by physical violence? I mean that a pro independence legislator prevented the Republic of China legislature from holding a vote on the two amendments by snatching a cloture petition from a Pan Blue legislator, stuffing it into her own mouth, chewing it up, then spitting it out and tearing it to pieces. Female Democratic Progressive Party legislator Wang Shu-hui snatched the cloture petition from the hands of female People First Party legislator Ko Shu-min while Ko was was on the way to the podium to present the petition to Speaker of the Legislature Wang Jing-Pyng. 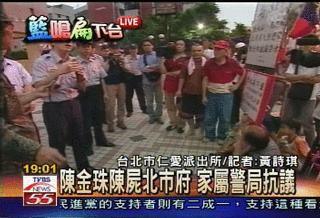 A dozen or so DPP legislators then surrounded Ko, preventing her from reaching Wang and retrieving the petition. 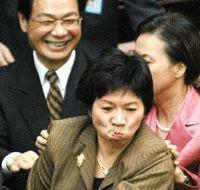 Wang stuffed the document in mouth to prevent Ko and other PFP legislators who rushed to Ko’s aid from retrieving it. Wang chewed on the petition, mutilating it. She later spat it out and tore it into tiny pieces. Cloture, for the record, is a parliamentary procedure by which debate is ended and an immediate vote is taken on the matter under discussion. It is also called closure. The cloture motion would have ended the DPP’s fillibuster and enabled a vote on two amendments to the Statute Governing Relations between the People of the Taiwan Area and the Mainland Area. Article 28 of the Statute Governing Relations between the People of the Taiwan Area and the Mainland Area forbids airplanes and ships from traveling directly to the mainland unless specifically authorized by the government. Mainland airplanes and ships are barred from Taiwan’s territorial waters and air space, unless explicitly allowed by Taipei authorities. The two amendments would have lifted the ban and required the government to allow direct flights and shipping within three to six months. The government would have had to draft a set of regulations enabling direct that period of time. The Republic of China Legislature was then forced by procedural rules to go into summer recess. 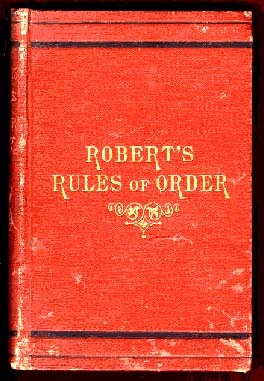 Will somebody please provide the “Democratic Progressive Party” and the Taiwan Solidarity Union with copies of The Common Law of Parliamentary Procedure and Robert’s Rules of Order? Not one Taiwan independence legislator, not one Taiwan independence elder, not one Taiwan independence academic, not one Taiwan independence pundit has spoken out against this outrage against the rule of law. n. A parliamentary procedure by which debate is ended and an immediate vote is taken on the matter under discussion. Also called closure. To apply cloture to (a parliamentary debate). 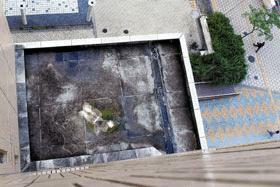 This article draws on information provided by the English language China Post.